Ulun Danu Beratan Temple (Pura Ulun Danu Bratan), a tourist attraction & a beautiful Bali water temple on the Lake Bratan, Bedugul, Bali - Indonesia. Ulun Danu Beratan Temple Bali (Indonesian: Pura Ulun Danu Bratan) is a water temple situated on the side of Lake Bratan, Bedugul Bali, Indonesia. Ulun Danu Temple is located in the village of Candikuning, Baturiti subdistrict, Tabanan regency, the distance traveled from Denpasar city around 56 kilometers to the north along the highway Denpasar - Singaraja. Ulun Danu Bratan temple is one among the best known Balinese Hindu temples and the most photographed tourist attractions in Bali island. 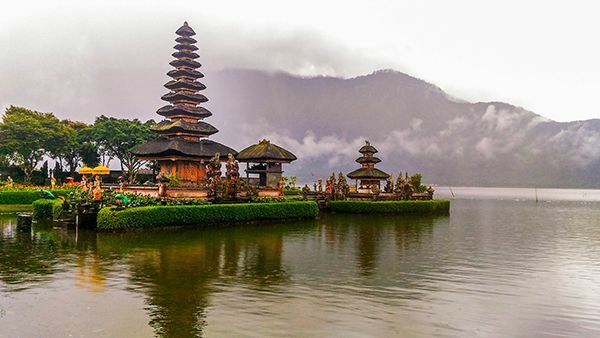 The Beratan Temple is typically known as Bali temple by the lake or Bali temple on the water as it appears like floating on the water whenever the water level in the Bedugul Lake Beratan is rising. Pura Ulun Danu Bratan is one of Bali's most visited tourist destinations, the location is visited by numerous visitors every day, both foreign travelers and domestic tourists. A short history of Ulun Danu Bratan Temple can be known based on archaeological data and historical data contained in a papyrus (Palm-leaf manuscript/Palmyra) chronicle of Mengwi. According to archaeological data located on the left of the front yard of Ulun Danu Temple, there is a stone sarcophagus and a stone board which comes from megalithic tradition period, around 500 BC. According to chronicle Mengwi, I Gusti Agung Putu as the founder of Mengwi Kingdom founded the temple on the edge of Beratan Lake before he founded The Taman Ayun Temple. Not described in the manuscript when he founded The Pura Ulun Danu Bratan, but only explained about the establishment of Taman Ayun Temple which the ceremony was held on the day Anggara Kliwon Medangsia, Çaka year 1556 (1634 AD). Based on the description in the manuscript of chronicle Mengwi knew that Ulun Danu Bratan Temple established before the Saka year 1556, by I Gusti Agung Putu. Since the establishment of that temple, The Kingdom of Mengwi became prosperous and I Gusti Agung Putu dubbed by the people "I Gusti Agung Sakti". Can be seen upon entering the Candi Bentar (split gate) towards Beratan. The temple serves to adore the majesty of God in its manifestation as the Tri Purusha Shiva namely Shiva, Sada Shiva, and Parama Shiva in order to invoke the grace of fertility, prosperity, human well-being and for sustainability of the universe. In this temple, there are three main shrines namely Pelinggih Dalem Purwa as a place to worship the goddess Durga and Lord Rudra revered as a source of prosperity, Bale Murda Manik (Bale Pemaruman) as the place for discussion, and Bale Panjang as a place to put the offerings. The shrines in this temple are facing eastwards, located on the banks of the southern side of Lake Beratan. It serves to Ngebejiang ceremony (to purify the ritual paraphernalia) and to invoke Tirta (the holy water). This temple also serves as a place for Melasti (Hindu Balinese purification ceremony) by the surrounding community. It is commonly called Ulun Danu Temple. This temple is also posted at the previous IDR 50,000 banknotes, in this temple, there is a sacred well that stores the Tirta Ulun Danu (the holy water of Ulun Danu). Not only that, in this temple also contained a Lingga which has a white color, flanked by black and red stone. The temple is believed to be the main source of water and fertility of Lake Beratan. There are two shrines in this temple that are a shrine with eleven roofs (Pelinggih Meru Tumpang Solas) facing toward the south, and a shrine with 3 roofs (Pelinggih Meru Tumpang Telu) which has four doors facing the four cardinal directions. It is located under a big banyan tree. This temple functioned as a place of goddess Durga. This temple is facing to the west and became the first temple found after visitors pass through the admission ticket's counter to enter the area of Lake Beratan. In the area of ​​Ulun Danu Beratan, there is also a Buddhist Stupa. The Buddha statue here indicates that the presence of the harmony in inter-religious life. This stupa facing to the south and is located outside the main area of ​​the complex Ulun Danu Bratan Temple. The Ulun Danu Temple at Lake Bratan Bali is very famous for its beauty that has become a favorite tourist spot in Bali, around this place have also been equipped with adequate accommodation such as hotels, villas, restaurants, spacious public park, and souvenir shops. Not far from the location of Ulun Danu Temple there are also some interesting place for a holiday like Bali Botanic Garden and Bedugul's fruit and vegetable market.